A brief inventory. Shamming the Shack by Lucas Lenglet consists of two installations. One on public view in the showcase that the gallery actually is, the other behind doors that will generally remain closed, where manoeuvres on display are prepared: two locations. One exhibition. Distance. The formalization of violence commences its tale some time in the past, around four hundred years ago. Towards the end of the 16th century, faced by the increasing complexity of weapon handling and the disciplined troops of the Spanish occupying forces, Prince Maurits of Orange felt compelled to introduce military reforms to curb the disarray of the State Army. Besides the halberd which, at almost six metres long had become barely manageable, it was predominantly the introduction of the fuse musket – technologically advanced but highly unmanageable in practice – that called for handling to be systematised in order maximize its efficiency. Using the musket entails a series of different actions to be carried out not only in strict, set succession, but also with the utmost precision. To ensure that these conditions least affected firing speed, Maurits takes two measures to assure the optimal functioning of the infantry: on the one hand he introduces a tactical fall-in system for the soldiers, and on the other hand he organises the loading, firing and reloading process into forty-three different sub-operations. The soldiers, put through a personal weapons drill, were thereby trained to perform the entire range of timed sub-operations involved in musket handling in thirty seconds flat. A further training exercise – a drill to perfect soldiers’ group marching techniques and line-by-line advance – is in turn ceaselessly repeated until the musket can be handled blindly within the automated movement of the formation as such. The ultimate result was an infantry that, responding to commands, operates as one body or, perhaps more accurately, as a machine. Maurits’ method of ordering a disorderly whole – in this specific case an army corps – is an example of what could be called rational formalization. Formalization, in this case structuring [formatting, the putting into form of] the disorganized down to the smallest distinguishable subcategory, is realised on the basis of an analytical approach originating in mathematics and philosophy. The analysis, the literal ‘dissolving’ of a whole into indissoluble parts ’liberates’ the sum [total, whole] of the parts from its contextually determined appearance: the operation of the infantry gets abstracted. Consequently, the musket handling of the collective of soldiers is the product of what could be referred to as mathematization: the constant elements, distinguished on the basis of analysis, are placed within a formula or structure that is generated by the parts themselves. It is a structure that in a general sense enables the addition of any number of variables and, notwithstanding, of continually arriving at a decisive conclusion based on logic. And finally, the specificity of the ‘weapons drill’ is actually nothing more than a further disembedding of this mathematization, say, militarization: The abstracted and structured action of loading, firing and reloading the musket within the formation is divorced from the individual soldier’s awareness and fed back in a collective context, that of the commando. Such an operating of the infantry as a collective, that can not be realized other than through a radical separation of action and movement from every context except the commando, lays the foundation for a new slant on the notion of ‘distance’. Distance becomes that which is required, by pursuing strict tactics, to organize the disorganized aiming at one single objective: the attack. Now what does this tangent, this description of the rational formalization of violence have to do with the work of Lucas Lenglet? Back to Shamming the Shack. 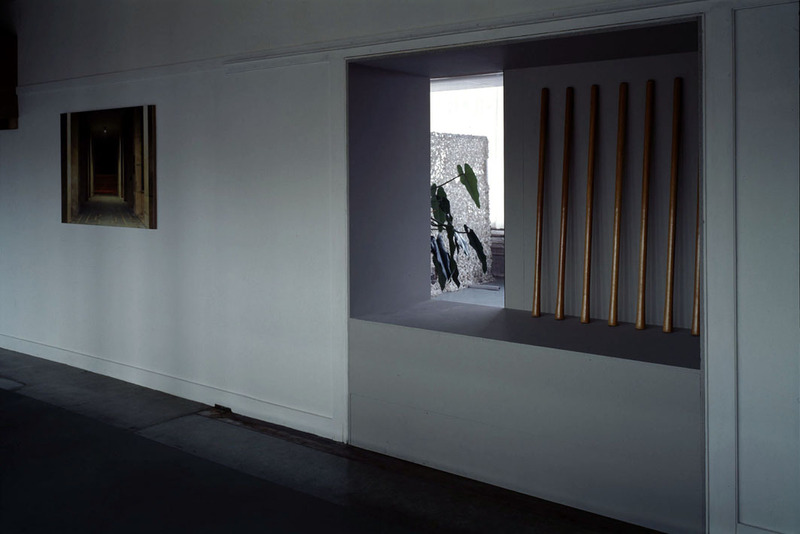 After reaching the third floor via a fire escape, the visitor finding his way from the Bloemstraat gallery to the private apartment on the Marcusstraat, enters a half-lit space. A mezzanine has been constructed in the room, a sort of look-out post the visitor could access using a ladder. It would offer him full view of the entire space, which unfolds before the visitor’s eyes. From floor level, however, the visitor will see nothing more than a gangway and a wall that reaches just above eye level along two thirds of the total surface area. Up to this point, the space seems to be an organised work area: precisely ordered objects are ranged according to a strict spatial lay-out. Tactics. A further inventory offers the visitor the following data: along the right wall lined with windows, white sandbags are stacked window-frame high. The pile serves as wainscoting or a barricade protecting the room from unwanted external infiltration. Or, on the other hand, the sandbags might just have been arranged temporarily, stored to be put into use for a similar cause elsewhere. The left-hand wall contains, holds a niche where seven slender clubs have been lined up, in battle array, again as though ready should the room need defending, or otherwise as neatly stored weapons to be used in an attack elsewhere. Next, the niche itself, and the wall behind the visitor, have been inlaid with narrow strips of glass. These allow a glimpse of spaces that apparently border on this one: ‘outside world-spaces’ that suggest a normal everyday life. A living room with pot plant, a kitchen with kitchen table and cooking utensils. The implication is that the space in turn serves as a look-out post from which to observe the unfolding of a day’s ordinary comings and goings. 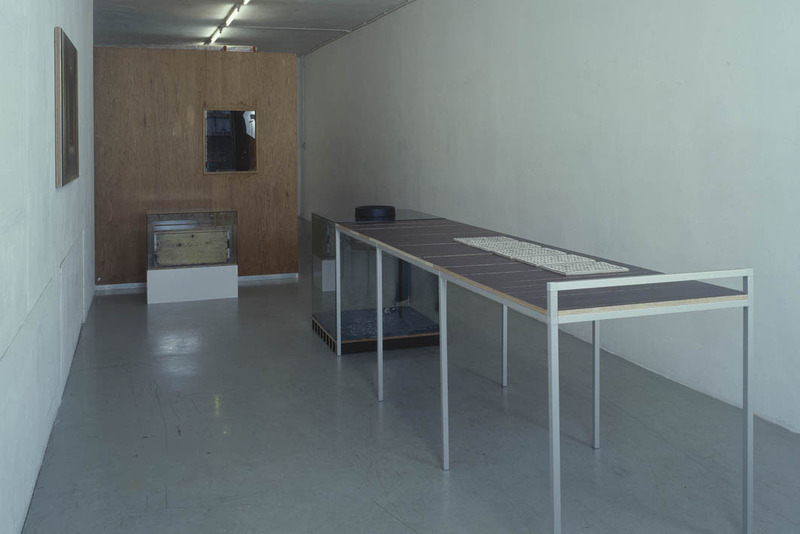 And then there are two works that are identical to those installed in the gallery space: just to the centre right of the room is a long narrow worktable. It is constructed out of a demontable aluminium frame with separate planks as its table-top – ready to be disassembled at any moment, and inconspicuously transported to wherever an improvised workspace is needed. 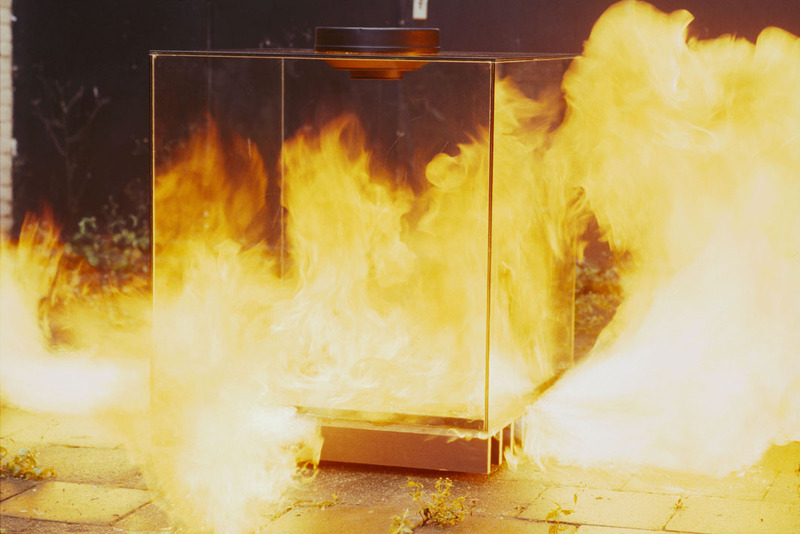 At the end of the table stands a glass cube – almost like part of the table, whose top consists of the round lid of a self-extinguishing container, and whose bluestone base bears the traces of the cube’s evident purpose. 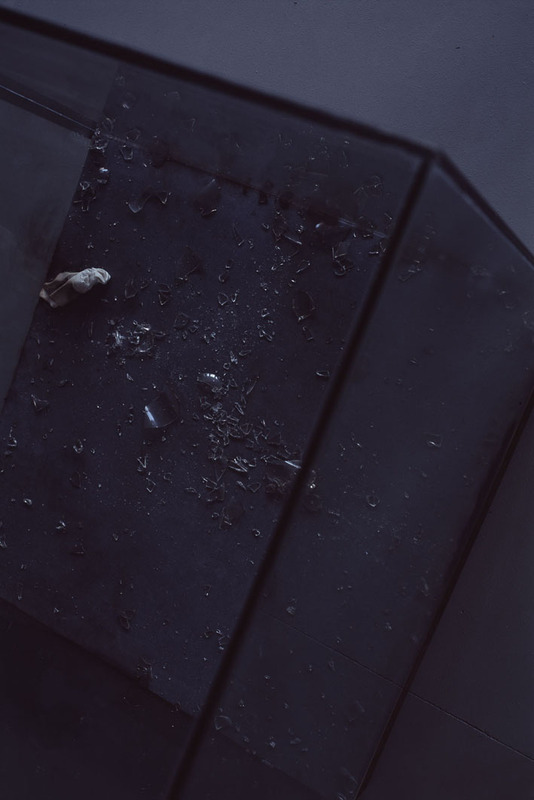 Shards of glass and a burned fuse are evidence of a realised explosion. On the table five piles of stencilled papers have been set out. They are printed with what appears to be a mathematical composition of different-sized ellipses in a raster measuring sixteen by six. 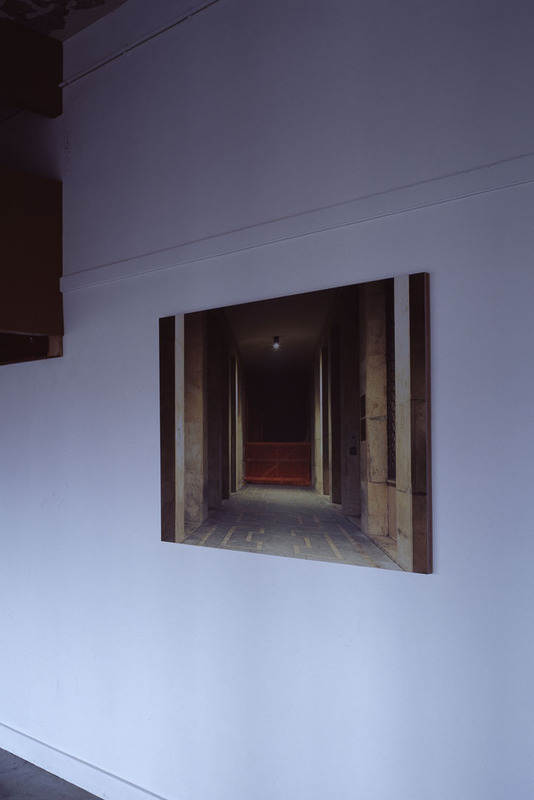 And, finally, there hangs the photo of a gallery suggesting an almost mathematically accurate depth with its meticulous composition its perspective though thrown off kilter by a construction which obstructs two thirds of where our field of vision should extend, leaving us guessing as to what is behind it. The menace emanating from this space is an almost tangible one. The individual works presented here all speak the language of violence, discipline and order albeit in an abstracted, stylised form. Each of the elements present refers to earlier works by Lenglet, or is a literal representation of them. Brought together and arranged in one room in the Marcusstraat for the first time, they form a tactically ordered collective. 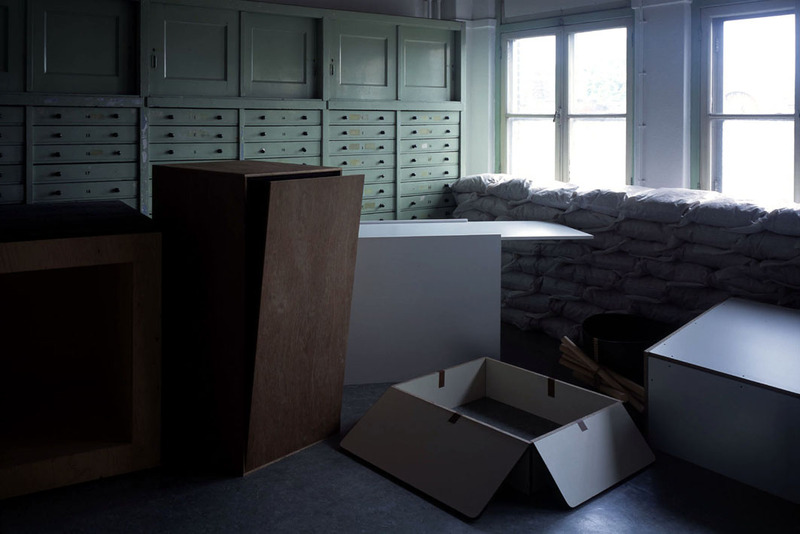 It is impossible to understand this installation as an attempt at a realistic staging of – give or take – the hideout of an underground anarchist or terrorist. The fact that in this space no concrete preparations for acts of violence are taking place is evident. The separate works are, with their extremely aesthetic appearance, only reminiscent of violence not sufficiently realistic to give body to this assumption. But how, then, should the installation be understood? To arrive at a possibly more fruitful reformulation of this question: because Lenglet employs violence’s abstracted language of form, structuring the separate works in the installation in turn according to the principle of the formalization of violence described above, it could be said that here we are seeing a doubling of formalization. Which gives rise to a more specific question: what is the goal of ordering disorder or, in other words, what is the tangible menace directed at? Attack. Mathematization always contains an immanent danger: the danger of its autonomisation. When the mathematized entity can not be traced back to a context or, to use Prince Maurits’ approach, when it is no longer something of commandos, but instead moves as a single aimless body, as a driving force it then becomes the paragon of the impotence of human reason. Analogous to this, this danger exists when mathematization is deployed as creative force. When the formula used for whatever reason reaches the point at which there is literally no way through, and it can neither reach its goal and is no longer embedded in the material from which it derives its constants, it becomes the model of aporia: the inability to resolve a self-created issue or, in other words, the perfect example of despair. The attack that Lenglet unleashes in his work turns out to be a double attack that only reveals itself in the rear portion of the space that is blocked from view. 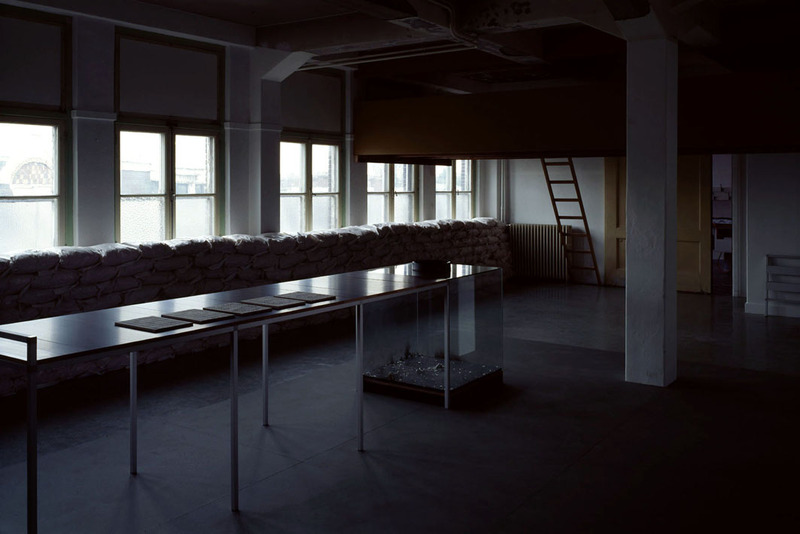 Behind the temporary wall of a black cotton-covered palisade that screens off the last third of the room, is a collection of objects. At first they seem to be a grouping of crates carried from the work floor so as not to obstruct or break the concentration of the preparations for the attack. 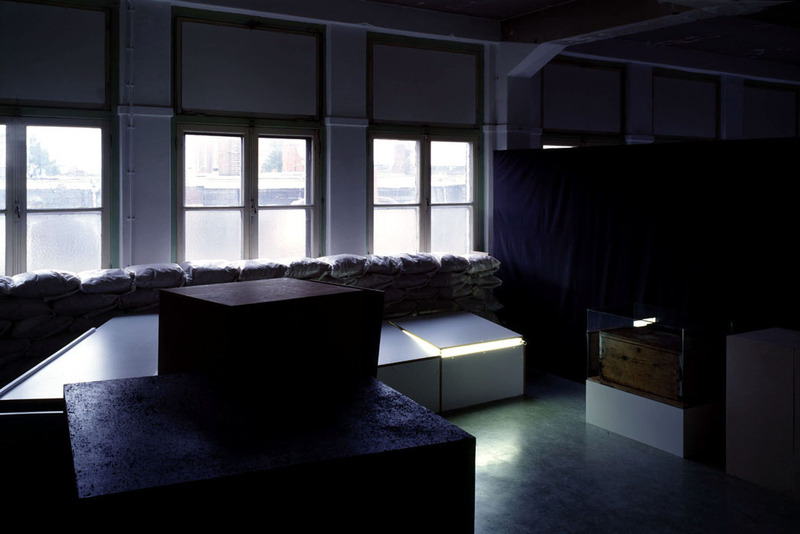 The crates are unsealed, suggesting willingness to allow visitors who have penetrated this far, to see their contents. But the viewer is being shammed. Balancing on one leg in an attempt to estimate the depth of the furthermost case, the sliding lid of which is partly open, kneeling before a crate in the form of a glasshouse that, half closed, seeps a narrow bar of light, or reaching for the hidden bottom of an overturned cube that seems too solid to not be hiding anything, he is forced to conclude that his investigations yield nothing. 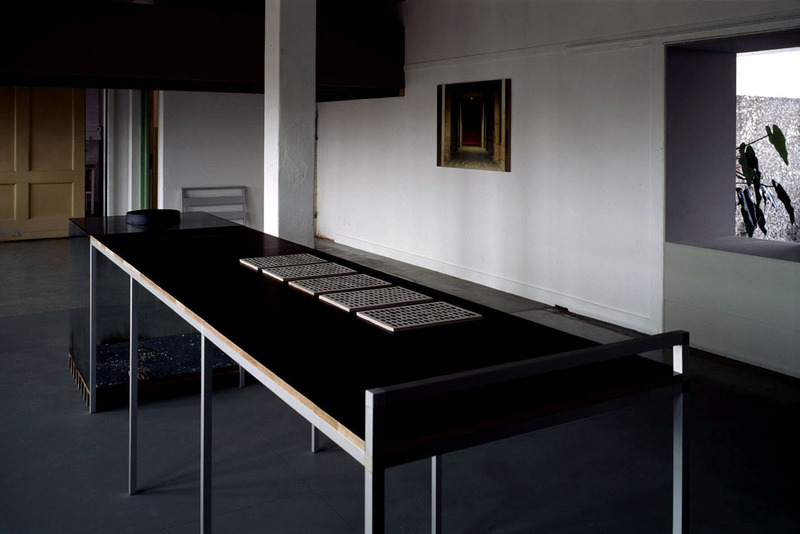 The crates have been set out so the viewer can only reach them by displacing them. From this perspective, that the viewer is compelled to assume, they fail to disclose their secrets. But then: however perfect the formal proportions of every crate may seem and however logical their design basically appears, there’s something awry with each of them. A standing crate with a hinged flap at the bottom, slightly open, that will never close because the flap is blocked by a cushion. A box that seems a case but has no bottom. A crate on its side with a seemingly pointless secret bottom, and that should be closed by a top that is too long for the opening to be covered. 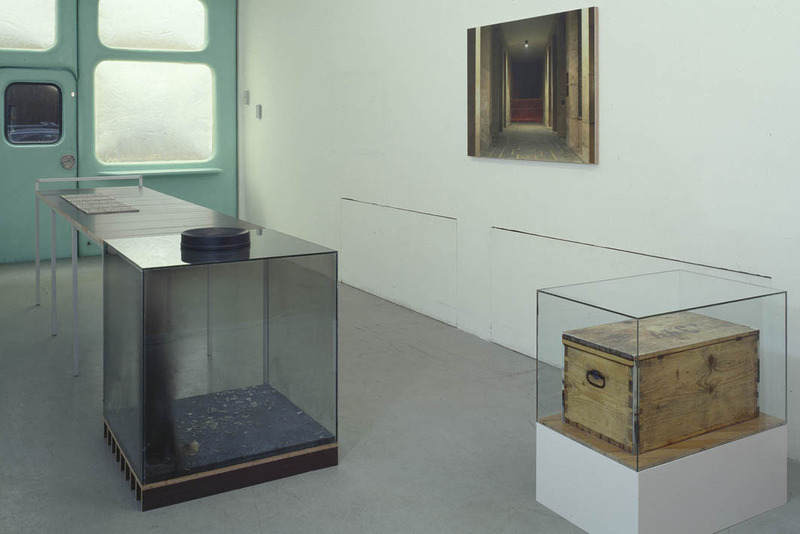 It is the unanswered question that will make the visitor decide to look at the crates longer, which will point him to the objects’ disfunctionality in the second instance. And it is precisely in this illogicality of the design that a first answer to the question of what the object of Lenglet’s attack is, should reside: its goal is the formula or structure to arrive at a decisive, logically-underpinned, design. The re-embedding occurs in a personal aesthetic the prevalence of which can not be understood to mean anything other than a manifestation of consciousness. The second attack, in its turn, is actually already formulated in the way in which the visitor should be able to arrive at the conclusion that has just been drawn: the attack is targeted at the public itself. The danger of detachment from the audience is undermined by a provocation of it. Subsequently, the tangible menace does not result from a concrete but from an abstracted aggression. Or, as Lenglet himself states: a restrained aggression, not out of fear of the consequences but out of discomfiture at too great an honesty that is almost always coupled with a form of intimacy. And with this the formalization of violence in Lenglet’s work has nothing to do with violence as such. As the formalization of violence it is neither more nor less than a method of structuring disorder with the purpose of achieving a set objective and on the basis of maximum efficiency. With this, Shamming the Shack could perhaps be understood as a visualization, or model, of an attempt to safeguard ‘distance’ in a bid to communicate with its public, to fend off personal aporia. Or, perhaps differently, as the visualization of an attempt to bridge that distance, to maintain personal isolation, and with the greatest possible respect for those to be reached. Shamming the Shack forms a whole, the crate objects of which are a pars pro toto: it is the hidden that could be being harboured that invites speculation. Freely sourced from: Coppola, F. F. and Millius, J., Apocalypse Now – screenplay, 1975 / Descartes, R., Cogitationes Privatae, 1619 / Giddens, A., The Constitution of Society, Outline of the Theory of Structuration, 1984 / Krauss, R., The Originality of the Avantgarde and Other Modernist Myths, 1985 / Numerous conversations with the artist.